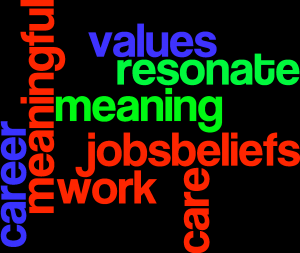 In the midst of this campaign season’s speeches about the economy and job creation, we should stop and think about the personal meaning of work and whether we are providing enough opportunities for young people to discover that meaning for themselves. This is especially true for the many members of the younger generation who are planning to enter the workforce right out of high school or after attending community college. We tend to view their relation to work in strictly functional, economic terms. Yet they – just like their peers headed toward the baccalaureate – are newly realizing how important work will be in their lives, how it will shape who they are and what they can do in the world. They are desperate to be somebody, to possess agency and competence. For close to 15 years, I’ve observed and interviewed young people as they prepare for an occupation through high school or community college programs. I’m often struck by the value and hope they place in securing a solid job that will engage them. But these future workers also talk about feeling secure, having a stable life with their feet on the ground. Those who desire a family — or already have one — want to be able to provide their kids with a good education. They want work that draws on their talents and teaches them new skills. They hunger for what we all want from our work. “There’s so much to think about,” one student excitedly related. And some, like Carlos, find self-expression in work. A teacher connected Carlos with a construction company, but many in his shoes are not so lucky. Youth unemployment is perilously high, more than double the national unemployment rate of 6.3 percent, with the numbers even higher for the vocationally oriented group. Those who do find work often land in unstable minimum-wage jobs with limited, if any, mobility. The Great Recession negatively effected youth employment opportunities, but the trend toward a tougher employment market for young people began before the recession hit in 2007. Compared to a generation ago, business and industry provide fewer in-house training opportunities, and formal apprenticeships have been in decline for some time. So, too, has funding for government-sponsored youth work programs and grants. Policymakers are aware of the gravity of the problem but often seem to squander the chance to address it when confronted with the perfect platform. In late July, for example, President Obama gave a speech at Los Angeles Trade-Technical Community College on workforce development. He spent more time berating corporations that seek offshore tax havens than he did addressing student debt or his new job training program. The setting for a political speech is often simply a stage for a message aimed at a larger public, but it was a lost opportunity for our most visible national figure to speak to the minds and hearts of the many thousands of young people across the nation enrolled in occupational programs like those at L.A. Trade-Tech. Public leaders should take advantage of their bully pulpits to remind the country about the personal and societal goals that are realized when young workers take those first steps into the adult workforce. By giving public voice to what work means for our young carpenters and welders, chefs and hairstylists, nurses and first-responders, our leaders can champion the creation of employment opportunities that draw on the full range of these students’ skills and aspirations. Mike Rose is on the faculty of the UCLA Graduate School of Education and Information Studies and is the author of “The Mind at Work: Valuing the Intelligence of the American Worker,” recently released in a 10th anniversary edition. A version of this article ran in the LA Times. I appreciate this perspective on young workers. It starkly contrasts with the view of young people espoused by many hiring managers and supervisors, whose views of workers are often obscured by the overwhelming influence of organizational needs.